The world is opening up more and more to travelers, and world-wide vacations are becoming quite popular. A timeshare vacation, whether it be a timeshare rental, a timeshare exchange, or the purchase of a resale timeshare, is making global travel easier, and soon the world will be your oyster. A case in point is Africa, which is poised to become the next vacation destination superstar. Ever since it burst upon the collective consciousness of vacationers the world over when the 2010 World Cup was held this summer in South Africa with such resounding success, the World Tourism and Travel Council (WTTC) has been excited about the prospects of increasing tourism to African countries. See Africa timeshares. One such country is Zimbabwe. Formally known as Rhodesia, Zimbabwe is located in the south eastern part of the African continent. South Africa borders it on the south and Mozambique is on its eastern border, two countries already popular with world tourists. Interestingly, in the 1980s Zimbabwe (then Rhodesia) was a very popular tourist destination, and no wonder. 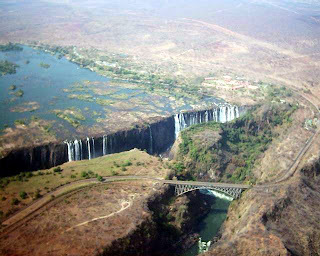 This is where you find the world famous Victoria Falls (see photo), one of the Seven Natural Wonders of the World. The fall's indigenous name, "Mosi-oa-Tunya," literally means the Smoke that Thunders. Victoria Falls National Park has an amazing rainforest that grows in the spray of the falls with giant ferns, palms, liana vines, and a number of trees, such as mahogany, not seen anywhere else in the region. On drives and walking safaris, visitors to the Park see many animal species including elephant, hippopotamus, and the rare white rhino. Tourism boomed through the 1990s until the political regime of Mugabe destabilized the country to the point that it became too dangerous for the tourism industry to remain. Major airlines such as Quantas and Lufthansa pulled out. Today Zimbabwe is considered by the WTTC to be a country that has the potential to become a world player again. Mugabe, now 86 and in failing health, no longer has a stranglehold on the country, and both the U.K. and the U.S. have lifted their bans on travel to Zimbabwe. Considered one of Africa's "tourism jewels," Zimbabwe could very well be in your timeshare vacation future. According to the WTTC, Zimbabwe’s tourism economy is set to grow 9.2 % this year, the fourth highest in the world, and is expected to continue growing at 8.2 % yearly over the next decade. Looking for a Zimbabwe timeshare rental? Post your timeshare rental request here!